We found a bottle tree. Actually we found a garden of them shining in the afternoon sun while we were driving back to Ocala from Homosassa Springs State Park. It was one of those "turn the car around we have to take a closer look at that" moments. 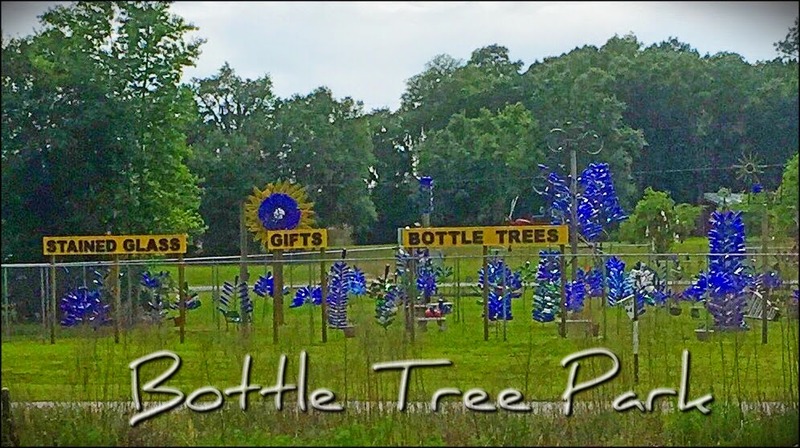 The artists call it a Bottle Tree Park. When completed it will be open to the public so that family and friends can stroll among the sculptures. We have seen bottle trees before. We have even chuckled and poked fun at the excellent recycling of all of those wine bottles. These blue bottles shining in the sun had us expressing ourselves differently. No redneck lawn ornaments here. This is art. There were bottle tree garden gates, bottle tree bicycles and framed bottle tree sculptures that reminded us of primitive paintings. The predominant color was blue, but there were also pale green and clear bottles represented. We also learned that bottle trees have a long and colorful history dating back to the African Congo in the 9th century A.D.
Folklore would have us believe that spirits can inhabit bottles and that once trapped inside they cannot find their way out. Empty bottles left outside the home capture spirits that are then destroyed in the daylight hours by the heat of the sun through the glass. 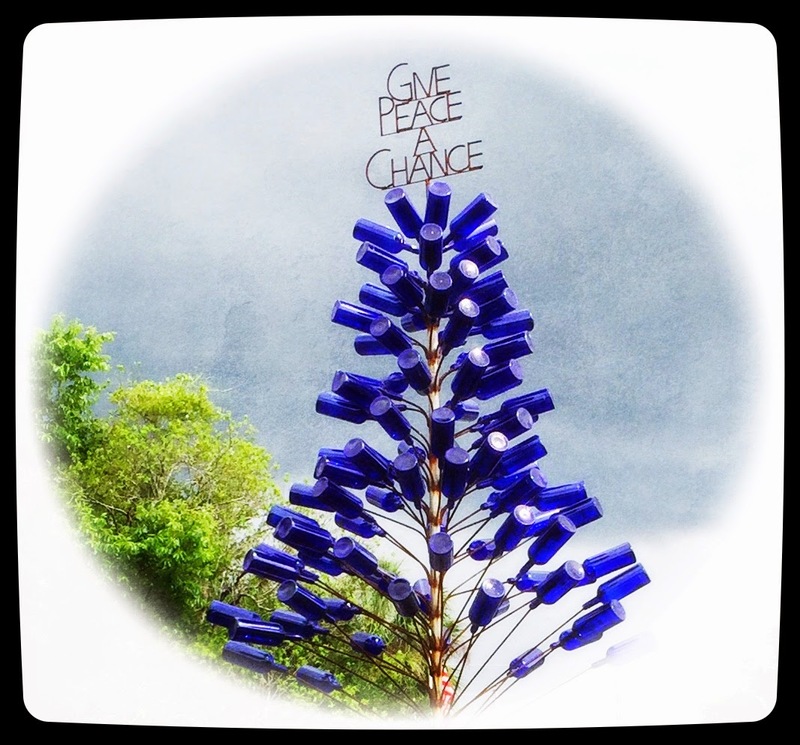 I'm all for getting rid of ill humors and other nasty things so a bottle tree may be in our future. 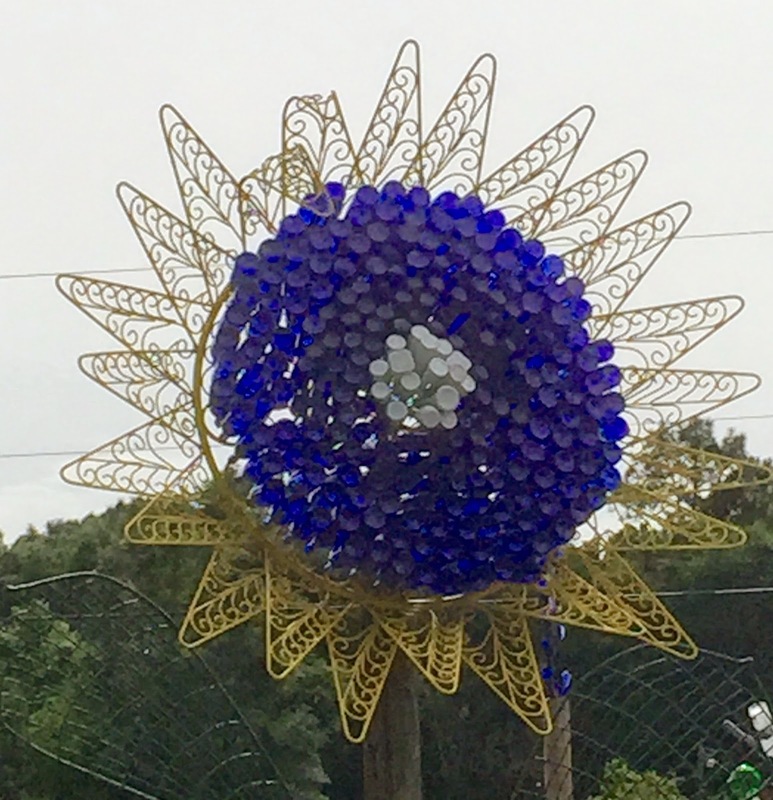 Cubby's Art Studio is home to the Bottle Tree Park. Cubby's is a stained glass studio that also offers classes in glass fusing. When we return to this part of Florida I would love to participate in one of the Saturday fusing classes. Very cool, Bonnie! Those are the fun sort of things that are found by staying off of the interstate. Great find! I enjoy trip planning but the unexpected finds are so much fun.